GameStop is apologizing for the Deus Ex: Human Revolution coupon kerfuffle with a $50 gift card and a two-for-one preowned offer. 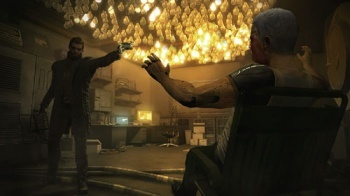 GameStop really stepped in it with the PC version of Deus Ex: Human Revolution. After discovering that the game was packed with a coupon for a free copy from cloud gaming service OnLive, the company made the remarkably boneheaded decision to open all the boxes, pull the coupon and sell them without it. That went over about as big as you'd imagine, but then it managed to poke itself in the other eye by announcing the next day that it was pulling the game off the shelf completely until it had new, coupon-free copies. Preorders would be filled with existing copies but customers wandering in off the street would have to settle for the Augmented Edition or nothing at all; nobody was getting screwed too hard but in PR terms it sure didn't help. But now GameStop is trying to set things right, or at least dial back the internet anger machine, with an email sent out to customers saying the company is "truly sorry" for putting them in the middle of a dispute between it and Square Enix. It's also offering some pretty solid compensation to make up for it. "For your inconvenience, we would like to offer you a free $50 GameStop gift card and a Buy 2 Get 1 Free pre-owned purchase," it says. "We want to earn back your trust and confidence in the GameStop experience. Please bring in this email and your store receipt or order confirmation from GameStop.com and present it to a Game Advisor." As Joystiq points out, GameStop stores are just getting this email themselves and employees will no doubt have specific processes to follow that may take a little time to filter down. In other words, don't go charging into the store and start yelling at the poor schmuck behind the counter just because he hasn't heard about this yet. A little patience goes a long way. It's a generous apology - eligible PC gamers are effectively getting the game free - but the company dropped a mighty big ball when it started busting open Deus Ex boxes. What's the verdict, folks? Has GameStop bought back our love, or is this the sort of internet blood money we want no part of?